The article is a copy originally run by the “Daily Telegraph” in September 1939. It is a joint account of the rescue of the crew of the ‘Kensington Court’ told first by the Master, Captain J Schofield, and then by the RAF Pilots who effected it. Captain Schofield said that his ship, the 4,862 ton SS Kensington Court which was bound for Birkenhead from the Argentine with a cargo of wheat, sent out an SOS when a U-boat appeared and attacked them without warning. They turned the vessel’s stern to the submarine which kept firing at them from a range of about a mile. “After she had fired about five shots,” he said, “she came very close to the ship’s stern and I decided it was time stop the ship. I gave three blasts on the whistle and the crew took to the boats. One of the boats was lost. Shortly after we got away in the port boat there was a big explosion in the starboard well. We did not know whether it was a torpedo or shell. We started rowing away and soon afterwards saw an aeroplane. “I said: ‘This has come in reply to our SOS’. Everybody was pleased and we all started to cheer. Still, we did not think it was possible for them to rescue us that way. “We thought they would give a signal to a warship or something like that. When the first plane alighted on the water and someone signalled to us from the wing we began to realise that they were going to take us on board. “There was a second plane there. We told the officer that there were 34 of us, and he said he would take 20 and the other plane would take the rest. “While we were getting on board a third plane came over and flew round. We wondered how they would get us on board, because the sea was choppy, but a door in the side of the flying boat opened and a small collapsible boat was pushed out. “It was all very remarkable to us. It was the modern method of rescue and we have never had any experience like it. When we got on board they gave us cups of tea and cigarettes. 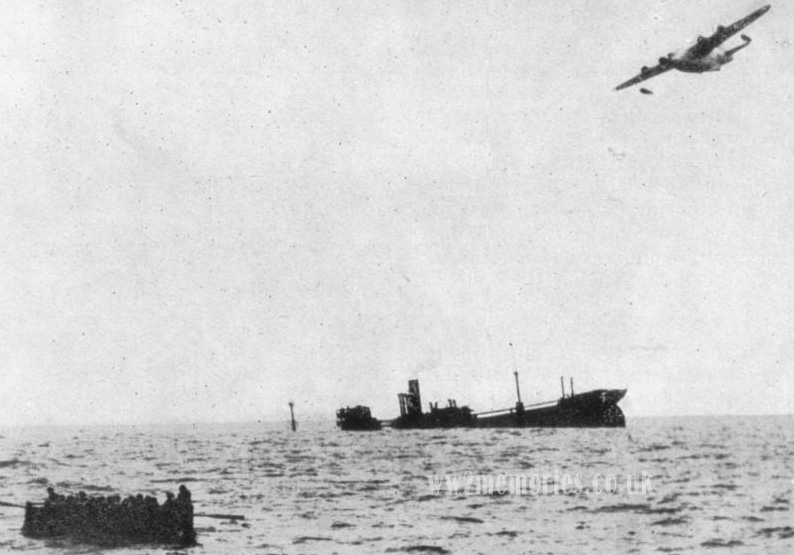 Captain Schofield said that they sighted the first plane half an hour after they took to the boats. The submarine steamed away after seeing that the shop was settling. She had left before the plane arrived. The pilot of the first machine on the spot, a 23-year-old Lieutenant, whose home is in Wimbledon, explained that they picked up Captain Schofield’s SOS whilst they were in the air on patrol duty. “We at once set our course for the spot indicated” he said, “and eventually found the Kensington Court sinking. “We alighted and, after signalling the men in the boat, blew up our rubber dinghy and pushed it out with a line to each end, and by this means we were able to ferry the men across two or three at a time. The Pilot commanding the other flying boat was a 25-year-old Flight-Lieutenant from Leigh on Sea, Essex. “When we arrived,” he said, “he saw the other plane was making attempts to take off the men. Quite obviously there were a lot, and so we decided to go down. One of the crew of the second flying boat was a young South African who was second pilot. This entry was posted in 1939, Family Memories & Stories, WW2 Articles and tagged aircraft, RAF Rescue, sea plane, sinking, SS Kensington Court, submarine, u-boat, WW2. Bookmark the permalink.